BRACEBRIDGE, April 12, 2019 – Spring has sprung, and along with the arrival of tender new foliage and the Easter bunny, comes a pre-addressed envelope from the Manna Food Bank, in your Thursday April 18 edition of the Bracebridge Examiner. You will find this envelope in the April 18 edition of the Bracebridge Examiner. Please consider using it to send a cheque to the Manna Food Bank. 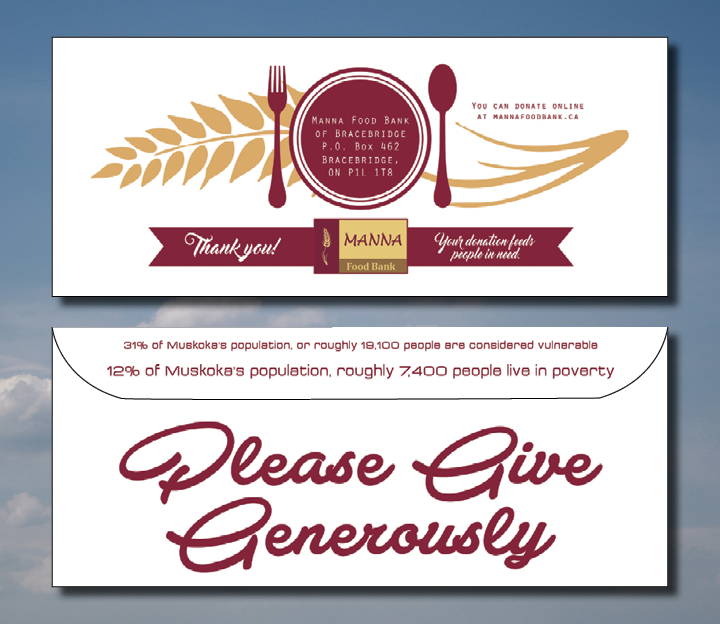 The Envelope Campaign happens just once a year and has been the largest financial fundraiser of the year for the food bank for much of its 25+-year history as a registered charity. Charitable donation receipts are given for all financial donations, either by return mail or, if the donor includes their email address with their cheque, by email. In keeping with the times, donations can also be made online — and at any time of the year — at www.mannafoodbank.ca. And if your envelope goes astray, you can always address your own, to Manna Food Bank, Box 462, Bracebridge, ON, P1L 1T8. While Robinson expressed gratitude to the community for consistently donating non-perishable food items, she pointed out that that much of the food that Manna distributes — including staples like bread, sugar and baby formula — must be purchased, so financial donations remain equally important. More than 30% of the population of Muskoka, or 19,000 people, are considered vulnerable; meaning those living in poverty, those with disabilities, and seniors. Manna helps about 600 local families per year, with children making up one-third of the individuals in those families. Most only need one or two visits to get back on their feet, while others require ongoing assistance throughout the year. The envelopes for the campaign are made possible with the generous support of Smellies Copy and Printing Shop. Robinson expressed gratitude to Smellies, and to the people of Bracebridge and beyond for their continuing generosity. The Manna Food Bank is a volunteer-run registered charity whose mission is to meet the immediate needs of the hungry in our community. Open Tuesdays and Fridays from 1 to 4 p.m., Manna is located in Bracebridge at Unit 45, 345 Ecclestone Drive. You can contact Manna at info@mannafoodbank.ca, or leave a voicemail at 705-646-0114.